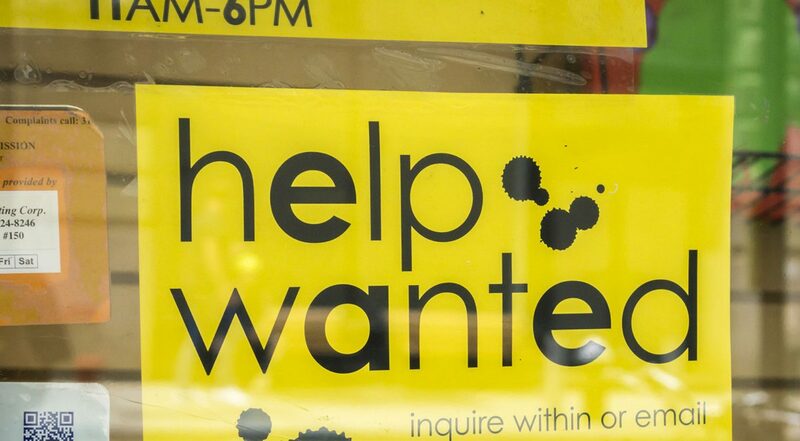 A sign in the window of DaVinci art supplies in New York advertises for workers. Hiring surged in February, but wage growth slowed. WASHINGTON — Hiring surged last month as U.S. employers generated the most new jobs since mid-2016, the Labor Department said Friday, but wage growth slowed as long-awaited gains in worker pay have yet to take permanent hold. 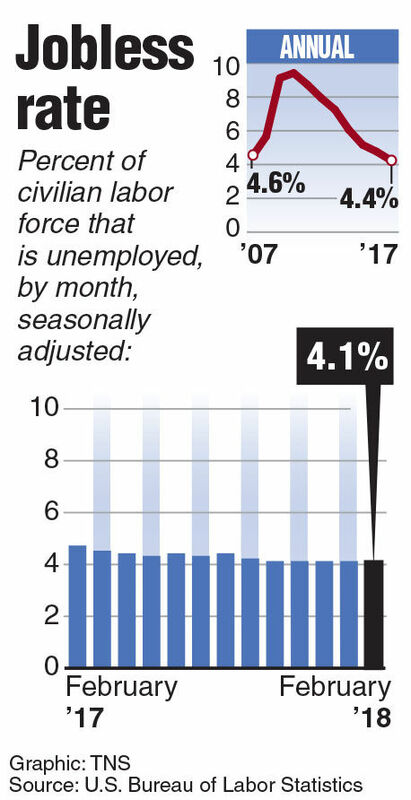 The unemployment rate held steady at 4.1 percent, the lowest since 2000, as the labor force swelled by 806,000. That was the biggest increase since 2003 and indicated more people were coming off the labor market sidelines to look for work. In Texas, the rate rose slightly in January to start the year at 4 percent, but the McAllen-Edinburg-Mission area had the state’s highest unemployment at 7.6 percent, Texas Workforce Commission figures show. Midland had the lowest unemployment in Texas during January at 2.4 percent. The Brownsville-Harlingen area was at 6.8 percent. TWC officials say the Texas economy has added 240,500 seasonally adjusted nonfarm jobs over the year, including 16,000 jobs added in January. Commissioner Julian Alvarez says the Texas labor market has had 93 consecutive months of positive annual growth. The 313,000 net new jobs added nationally in February far exceeded analyst expectations and were a major increase from the previous month’s upwardly revised 239,000 figure. Job growth for December and January was revised up by a total of 54,000 net new positions, meaning the economy has added a robust average of 242,000 jobs the last three months. “We think that this economy is humming along,” he told Bloomberg TV, giving some credit to the tax cuts that took effect at the start of the year. The February job growth was driven by big jumps in hiring in construction, which added a net 61,000 jobs, and retail, which increased its payrolls by 50,300. Mild weather in much of the nation last month could have added to the construction gains. But Jed Kolko, chief economist with employment website Indeed.com, does a monthly calculation excluding weather-sensitive industries — construction, mining and leisure and hospitality — and said his figures show there was no impact last month. The 229,000 net new jobs added when factoring out those sectors was the best since July 2016, he said. “It was a very strong jobs report … stronger than what we should all expect at this stage of a recovery,” Kolko said. The current nine-year economic expansion is the second-longest in the nation’s history, and by midsummer would be the longest. But there was a downside in the jobs report that economist Douglas Holtz-Eakin, president of the conservative-leaning American Action Forum think tank, called its Achilles heel: Wage growth slowed in February. Average hourly earnings increased 4 cents to $26.75 after a downwardly revised 7-cent gain the previous month. For the 12 months that ended Feb. 28, wages increased 2.6 percent. That was down from 2.8 percent for the 12 months that ended Jan. 31. The January year-over-year wage increase originally was reported as 2.9 percent, an uptick that fueled fears of higher inflation. Those concerns triggered a bout of financial market turmoil, as investors feared higher interest rates were coming to keep inflation in check. Jim Puzzanghera of the Los Angeles Times contributed to this report.